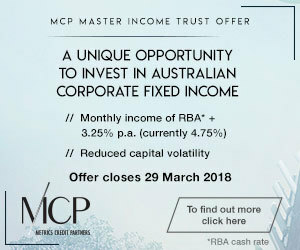 The MCP Master Income Trust (ASX: MXT) is the first ASX listed fund giving investors access to a professionally managed portfolio of corporate loans. Since listing in 2017 the MCP Master Income Trust has delivered on its objective to deliver capital stability and income. MXT has a target return of the RBA Cash Rate + 3.25% (4.75%*) paid via a monthly distribution. Due to strong investor demand the MCP Master Income Trust is now seeking to raise an additional amount of approximately $300 million via an entitlement offer to existing investors and by offering additional units to new investors. The Offer is now open, click here for more information.